Now I will be blunt from the get go and say that some of my Chanel Nail Colours (a fancy smancy way of saying nail polish) were more difficult than others to "dupe". In fact in the instances of some of the polishes I own I don't actually own an outright dupe but rather have a shade that gives a similar effect. As you can imagine that isn't quite the snappy title a post requires now is it? 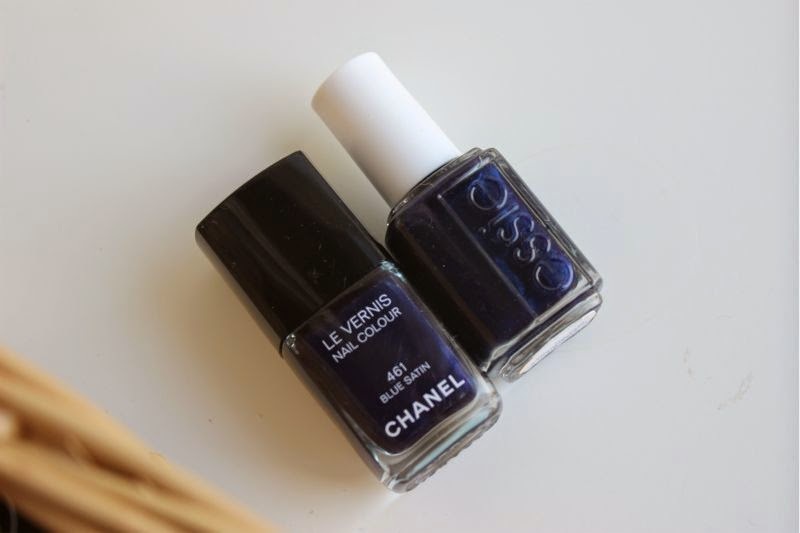 Both shades may as well be the same polish - a slightly metallic deep inky blue, navy by any other name. In some lights this reflects almost electric blue and is a great alternative to black polish. In all honesty there is next to no difference in shade (none that I can detect), both formulas are fairly thick, two quick coats and you are good to go. Again both offer a glossy finish. Save yourself the tenner (well almost) and pick up Essie Midnight Cami Nail Lacquer. I have also heard that Barry M's Navy Nail Paint is identical but I draw the line at having two navy polishes that I barely wear as it is! 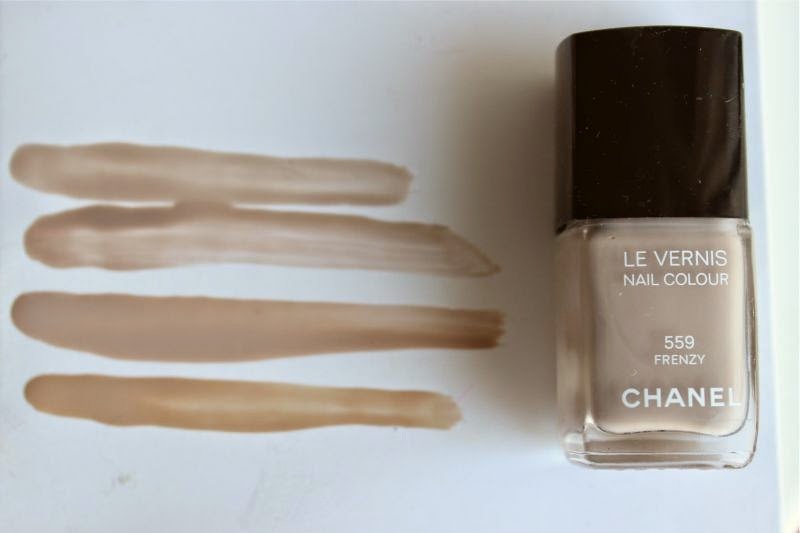 Chanel Frenzy is one of my favourite every day shades, it gives a polished but chic look and is great for those like myself who fall into the low maintenance camp when it comes to nails. However I am shocked at how dupes I happen to own. Create of habit and all that. Rimmel Salon Pro Nail Polish in Oh Mr Darcy is basically identical and a whole £13 cheaper but if you like really glossy nails go for the Revlon Colorstay Gel Envy Nail Enamel in Checkmate. If you are an Essie fan route through your stash and see if you own Essie Cocktails and Coconuts Nail Enamel as it isn't worlds apart. I put my hands up (geddit? ), I don't actually own a dupe for Chanel Holiday. 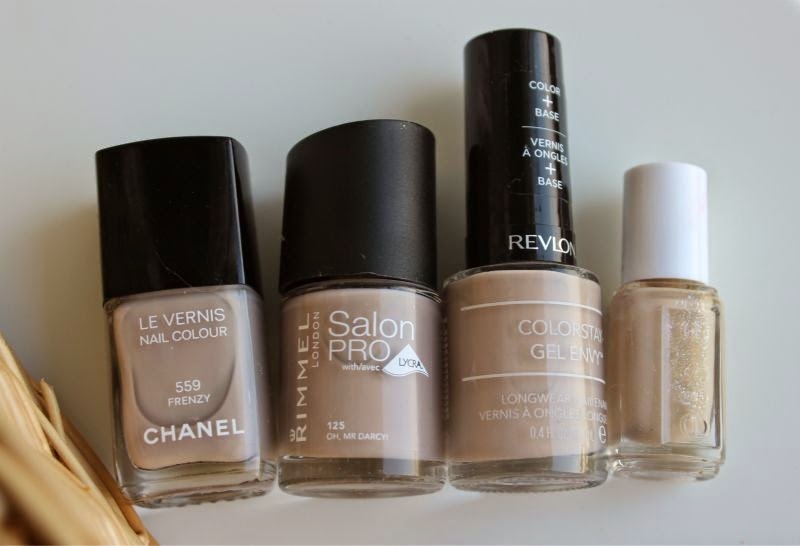 When I was planning this post it was fairly late at night and under artificial lighting Chanel Holiday Nail Colour and Revlon Colorstay Gel Envy Nail Enamel in Pocket Aces looked really similar. However in day light that appears not to be the case - Holiday is an orange red and Pocket Aces is a red coral both are bright and serve a similar purpose. However if you are looking for a more acurate dupe I would suggest Essie's Meet Me At Sunset is almost identical! 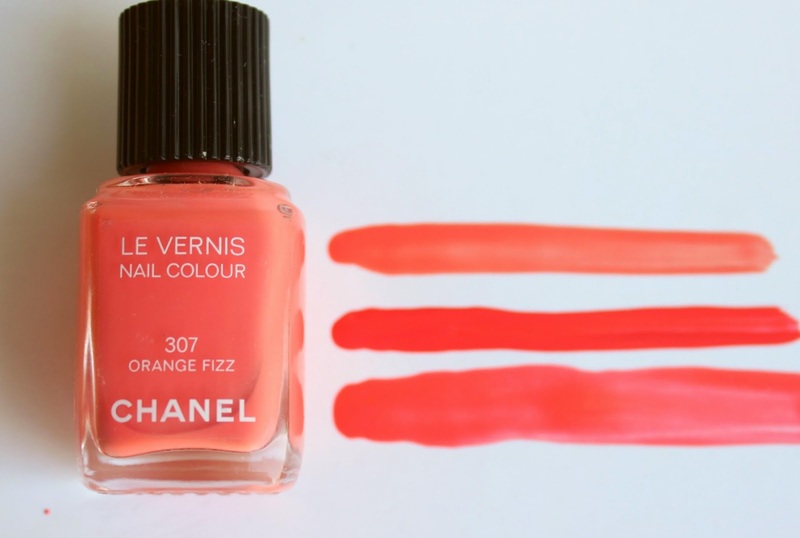 I used to think that Chanel Orange Fizz Nail Colour was such an original nail colour and that there would be nothing at all similar out there hence why I coughed up the £17.50! A quick rummage through my stash and I have not just one but two very similar shades. Barry M Nail Paint in Carousel is a little deeper and shimmer based but for £3.99 who can complain? If you do fancy this shade strike fast as it is limited edition. A great, glossy dupe in my opinion has to be Essie Sunday Funday Nail Enamel but again this is limited edition so again pick it up while you can. 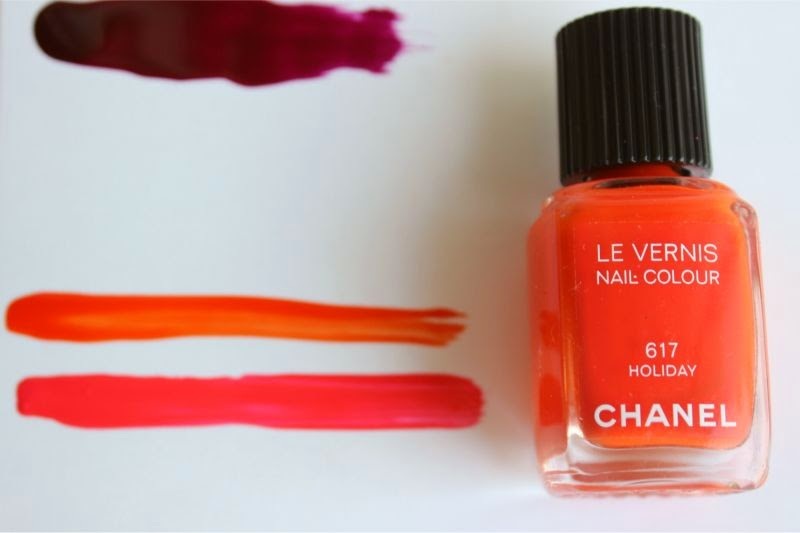 The easiest to dupe out of the bunch and yet one of Chanel's best selling nail polish shades. In my opinion Essie Sole Mate Nail is a dead ringer, Max Factor Gel Shine Lacquer in Sheen Merlot is similar but a little more special - more shimmer based and reflects golden. Boutique Nail Polish in Under the Thumb is a little more red based but at £5 who can complain. I know from the above images you are thinking hmm they aren't all that similar but trust me once on the nails the end effect is pretty similar. 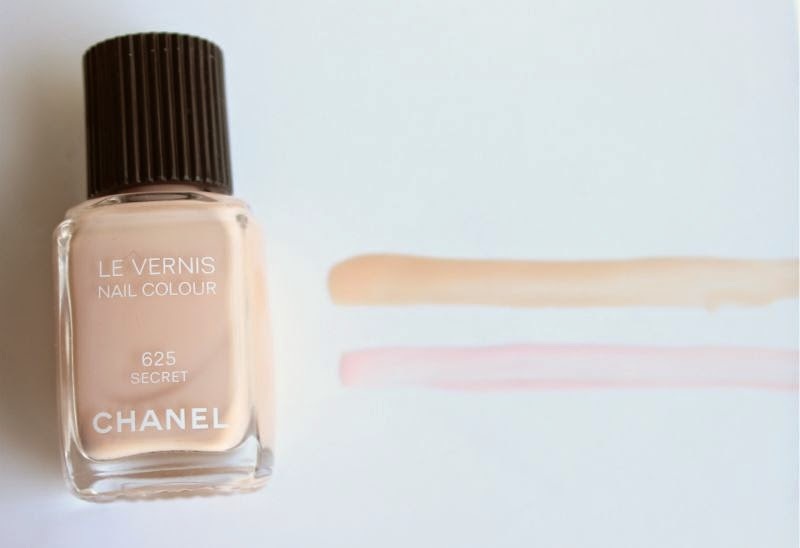 I adore Chanel Secret Nail Colour but the truth is any milky based pink will give the same effect when applied to the nails. 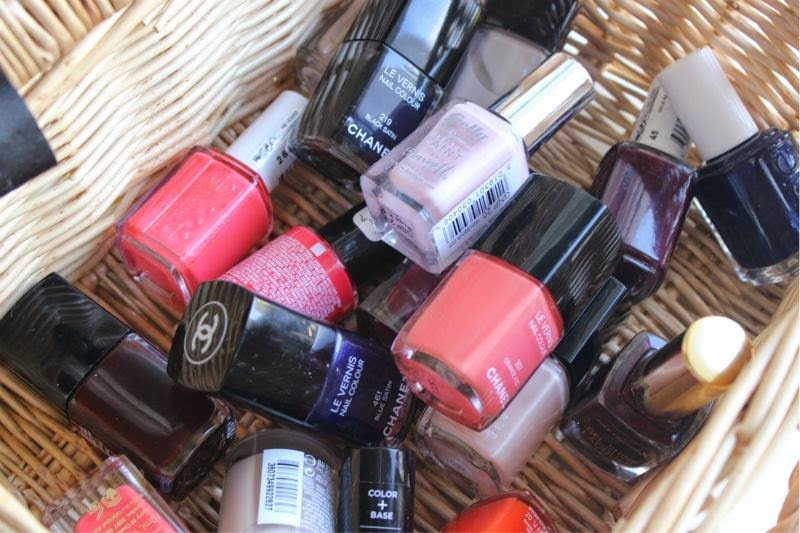 Another great dupe would be Essie Ballet Slippers which I'm guessing a good few will have in their stash? I also own Chanel Black Satin which is a glossy black - I didn't see any point in "duping" it as well any black polish with a glossy top coat (or not) will look identical on the nails. Wauw you got quit a stash haha! I really love the last colour. 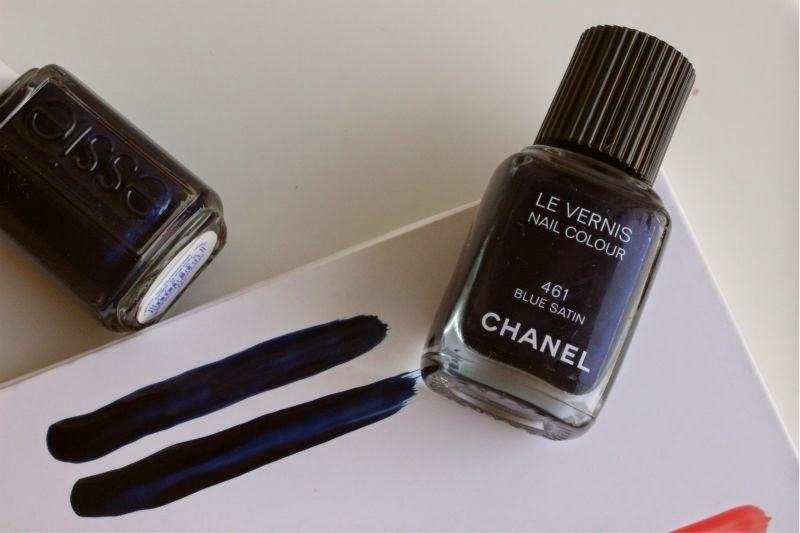 Love this post, would love to try a Chanel nail polish! I usually use Essie. 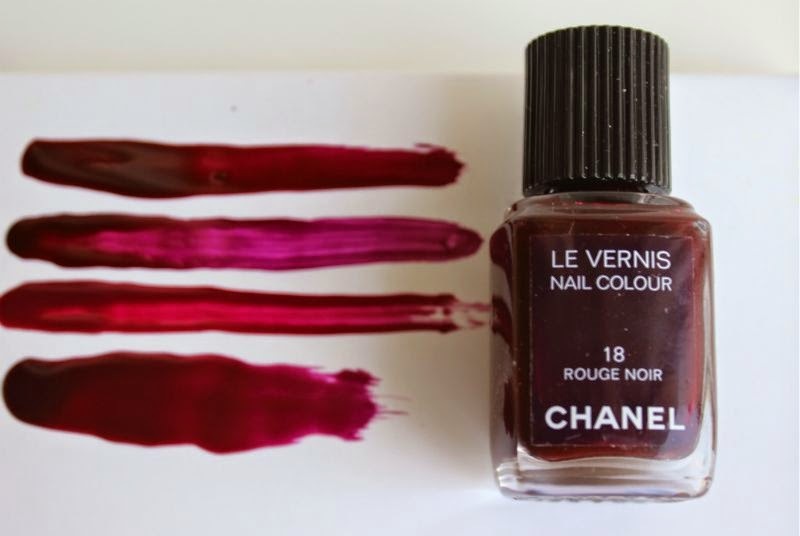 Revlon Vixen = Chanel Rouge Noir. Exact same shade & wears like a boss. Essie Midnight Cami looks GORGEOUS! Amazing dupes! I just buyfrom rimmel salon pro. Definitely the best nail polish out there. This is fantastic, I definitely need to keep this post handy! 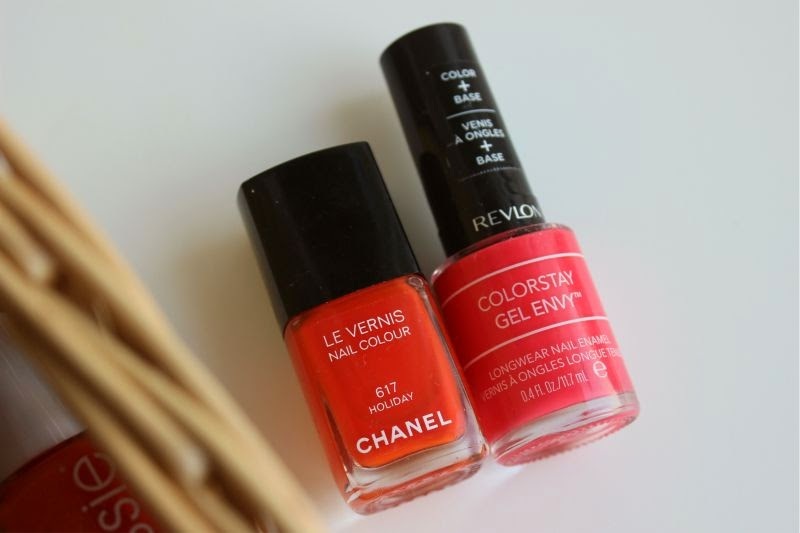 I love Chanel nailpolish (Orange Fizz is my all-time favourite) but I really shouldn't be spending so much money on them! 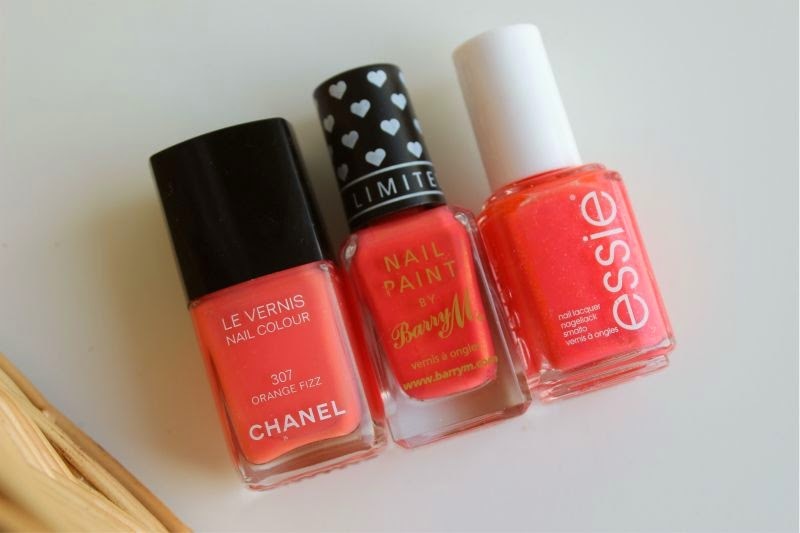 These are really good dupes, thank you for sharing! I love Essie Sole Mate! Great post too, really helpful for finding dupes. Such a great post! 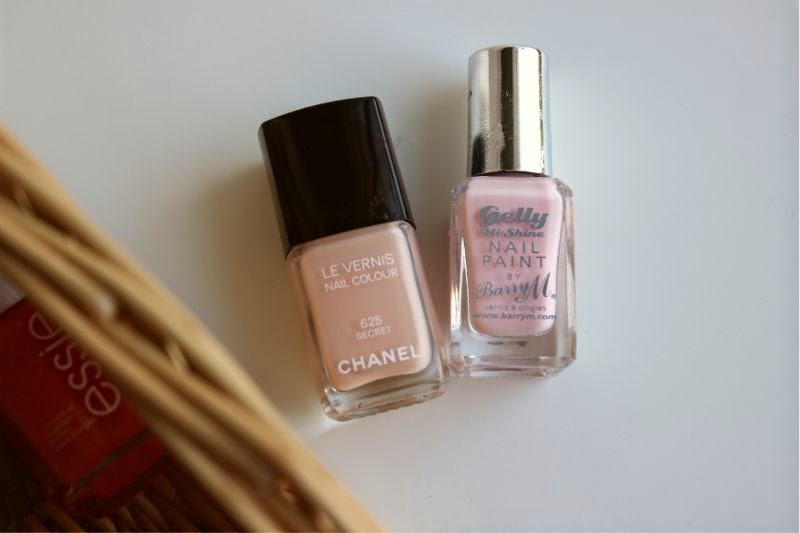 Always good to have dupes especially for Chanel polishes! Such a great idea! Will definitely be checking out a few of these now! Thanks for the dupes! 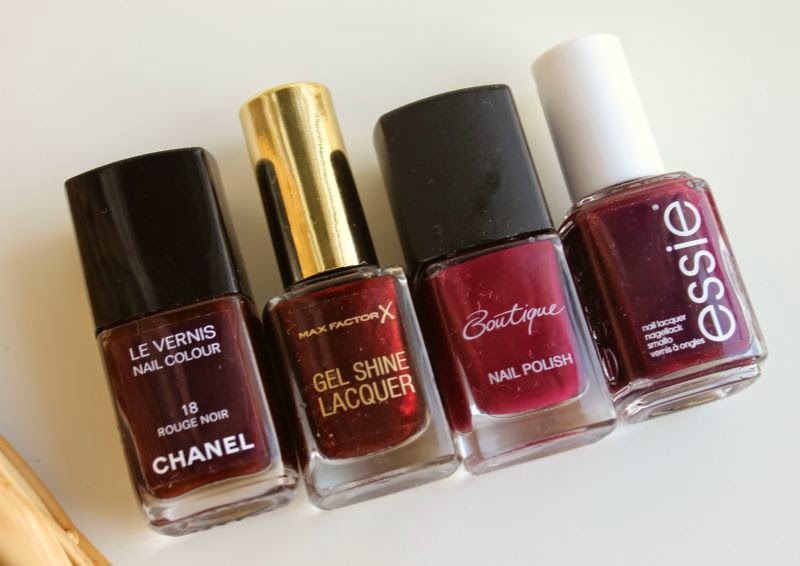 I have A LOT of Chanel polishes that are on their last legs, it's great to have some more affordable options!